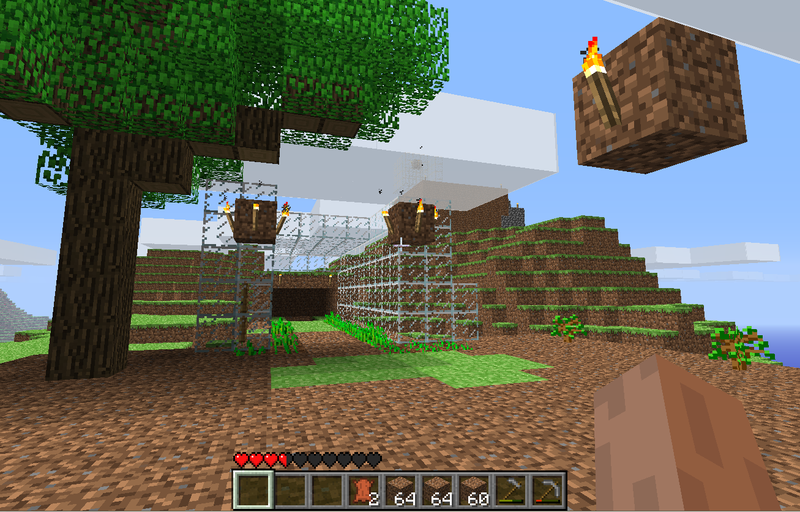 Since everyone in the world has decided they now love Minecraft, I felt duty bound have a little look see. Of course, what started as ‘a little look see’ is now rapidly spiralling out of control, threatening to consume every waking hour in search of that perfect, flawlessly constructed world. In a way, y0u could see this plucky little indie game as the ultimate in alienation – after all, shouldn’t we want to make the outside world into a reflection of our need for order, freedom and creativity? Well, yes, and then again, no. But that’s getting a little ahead of ourselves. The aim of the game is almost absurdly simple. You, the player (that’s your big fleshy disembodied paw you can see floating on the right there in the screenshot), are dumped into a randomly generated world, with only your basic tool-using abilities to fend off the nasty creepy crawlies that come out when the sun goes down. You punch down trees, dig holes in the ground, and smash rocks into smaller rocks. You use these materials to build better tools, shelter, to dig to find rarer materials, and eventually to construct massive, outrageous, physically impossible monuments to your own greatness. I’ll be posting some follow up criticism once I get my head around what this insane masterpiece is really all about. For now, just take my word for it. Minecraft is fun. Really, really fun. It is also still in Alpha, being developed by a tiny team who are punctilious about updating the game regularly (and also have some interesting things to say about piracy). So do yourself a massive favour, and fork over your £7. Or, seeing as sudden massive popularity has thoroughly borked the authentication server, play for free for a couple of days. You won’t regret it, although pets/bosses/significant others may.